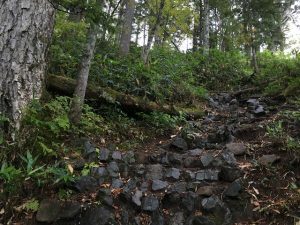 My third and longest climb in Hokkaido was the first on my 100 Summits quest that I almost failed to complete. But it wasn’t pain or exhaustion that almost cost me the summit. On Tomuraushi, as always, time proved my worst enemy. 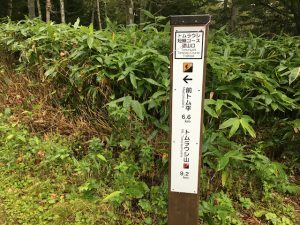 My guide Takuto and I began our hike at 7:40 am at the trailhead near Tomuraushi Onsen, where we’d spent the night. If you read the sign, you’ll notice the peak lies 9.2km from the trailhead – and they’re not an easy nine kilometers, either. The hike begins with a lovely walk through pristine forest. It has some uphill grades, but nothing too hairy–as long as the weather is good. 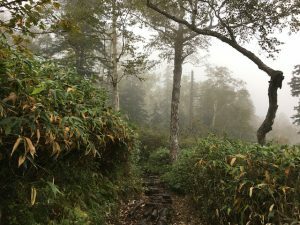 After about an hour, the trail emerged into a wetland area, where the foliage had begun to change. From this point forward, we hiked through a forest brilliant with autumn leaves. Two and a half hours in, we stopped for lunch beside a river that requires river shoes when it runs high. On the day we hiked, we hopped over it easily in regular hiking boots. 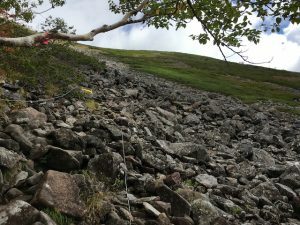 At the top of the gully, the trail crosses a massive rockfall in the first of several bouldering sessions on the way to the summit (each of which repeat on the way back down, because this hike is not a loop–you ascend and descend on the same trail). 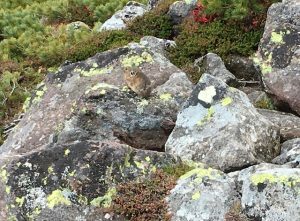 The top of the rockfall leads into another rocky section – this one, home to the endangered Japanese pika–the creature that was the inspiration for Pokemon’s most famous and beloved character, Pikachu! 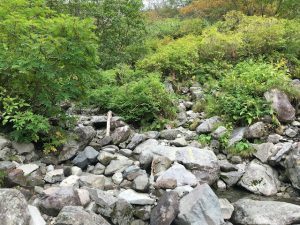 Although they’re often difficult to spot, Takuto and I heard over a dozen calling to one another from the rocks, and saw five of them up close. Two even stayed put long enough for us to take photos and record videos of them chirping (you can find the video on my Facebook page). 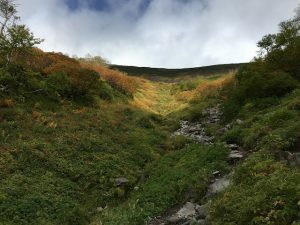 From there, the trail led up and over two more passes before arriving at Tomuraushi Park – a high-altitude marsh and field that fills with flowers during Hokkaido’s short summer season. From there, we finally caught our first glimpse of the summit, wreathed in mist and still more than an hour’s hike away. 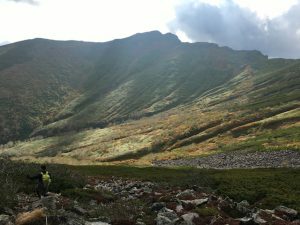 Since Tomuraushi’s lower slopes are home to brown bears, which can be dangerous if startled or surprised, it was important that we finish the hike before dark (the bears are most active at dawn and dusk, which makes an evening hike a dangerous proposition at this time of year). Because of this, we’d decided that our turn-around time was 12:00, 12:30 at the latest. 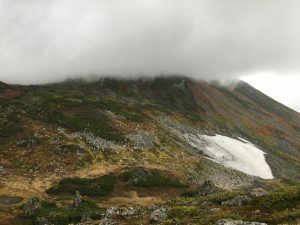 Unfortunately, 11:45 saw us still in Tomuraushi park, at least an hour (and maybe more) below the summit. My heart and my hopes fell all the way back to the trailhead. Part of me wanted to quit, and tell Takuto to turn around right there. 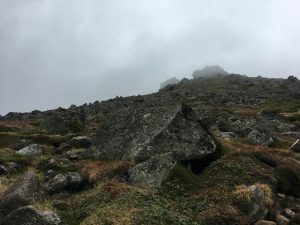 I didn’t see the point in hiking farther if the summit couldn’t happen. But I kept my mouth shut and kept hiking. In fact, I increased my speed. I hoped, even if we reached the turn-around time, my guide might give me a few minutes more, if I made it close enough to the peak. 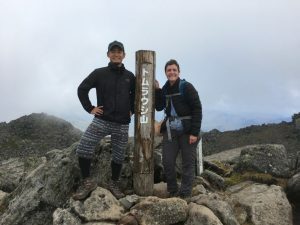 We arrived on top to find a pair of hikers who had just completed their 100th–and final–hyakumeizan, right there at Tomuraushi. We traded summit photos, stopped for a snack, and headed back down the mountain. With 9.2 kilometers still to hike, and dusk only six hours away, we had no time to waste. As usual, I found the descent far easier than hiking up. Despite the hours of climbing, reaching a summit always puts new wind in my sails. 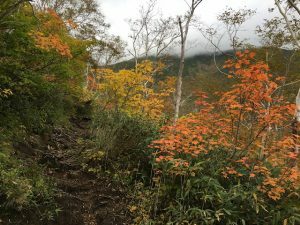 We had clouds at the summit, but as we climbed back down, the sun came out and the foliage glowed – and we almost reached the trailhead by dark. (By twilight, anyway.) And fortunately, we didn’t see any bears. This was my longest, and most difficult, 100 Summits hike to date and I’m glad I pushed myself to the summit. Every sight, and every step, was beautiful. Congratulations! Especially on seeing no bears! Rock star! Thank you for sharing your journey. I am enjoying going along with you on this physical and spiritual challenge you have set yourself. Thank you for taking me along. Thank you so much Alice! I’m honored that you’re going along with me.